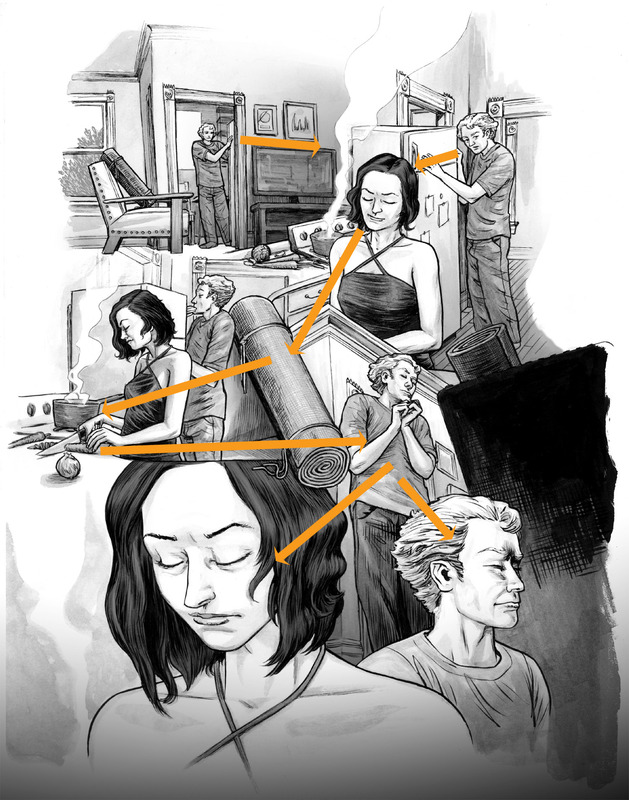 FLOW sums up a key concept in comics page or strip design: Underlying structures that make the work legible, flow and should not need to be explained to readers. Dialog always starts on the left, and you don’t want to cross tails! Lead the eye with word balloons in a logical direction..
Flow is a big subject, though to nail down simply. It covers everything from the rudimentary like having the first person speaking always on the left side of the panel, so that their word balloons tale won’t cross the next one when we read the page left to right. To what kinds of arrangements of panels can work, and which might confuse readers more. In a previous post I talked about grids, specifically the 9 panel grid but I mentioned there are many others. Part of why they help make, making comics easier, is that they can simplify the decision-making process of where the next panel goes. But, even if you never break them up or very panel sizes AT ALL, just use a grid, there are configurations of the content within that can break the storytelling, losing and confusing readers. So it’s important to learn a few basics about how to build Flow into your pages and make sure your comics are easy to read. Until recently there was no science to this just theory that I knew about. But in 2013 I read of a formal study done on panel layouts, and we can now say with some certainty how people are likely to read one based on a few kinds of page designs. That’s invaluable insight to add to the old wisdom, and I detail some other notions here that are borrowed for some other disciplines. Flow, left to right, and back again. First some basics. In northamerica and the western world, we typically read comics the same way as we do pages of text. Left to right, in horizontal rows top to bottom. Manga, Japanese Comics, reverse this running right to left. Both otherwise follow most of the same basic rules beyond that mirroring. We read Comics One Panel at a time–analogous to one word at a time–to the end of each row of panels–analogous to a sentence. And then back to the left [or right for manga] to start over. From left to right, top row first and then back and from left to right again. 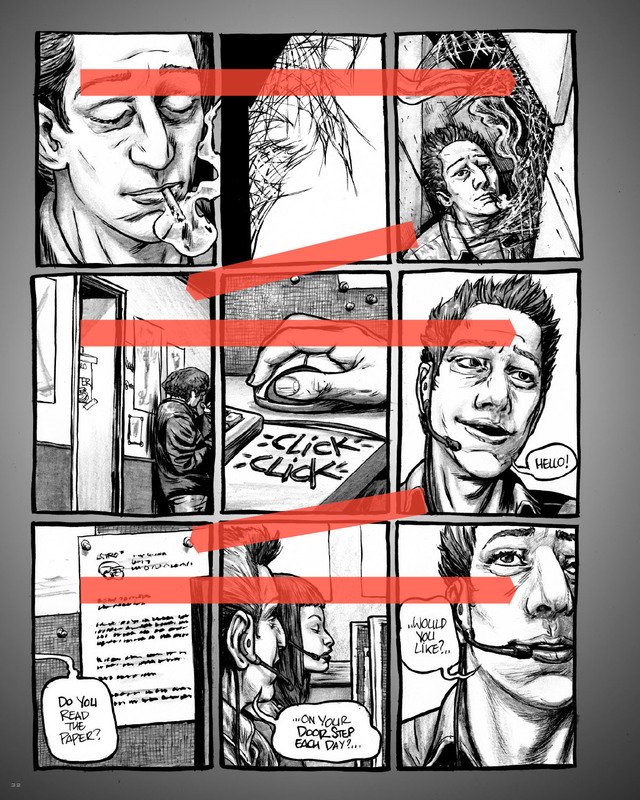 So in this nine panel page layout example, the arrows show how we’d read it. The spaces between Panels are called Gutters, and the area around the outside of the panels before the edge of the paper, typically is referred to as a Margin. Art that goes to the edge of the page is called Full Bleed. Text in Boxes = voice over or third person. Text in Balloons = speech, or thoughts as indicated by different styles of Tails, which indicate who is speaking or thinking. Now the study I mentioned can be read in full here. It was published in Frontiers in April 2013 by Neil Cohn of the Center for Research in Language, University of California San Diego. They took a famous experimental Jim Steranko page designed to confuse readers, and removed all the art from the panels. 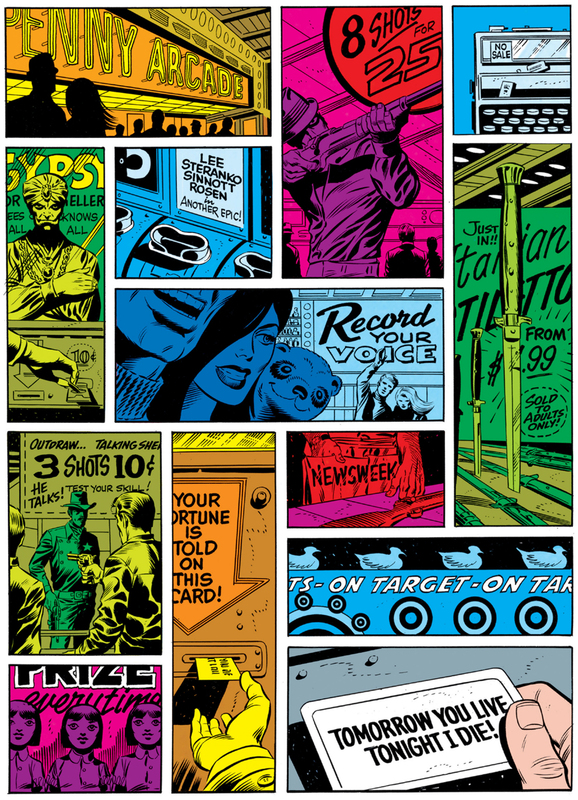 By the way, that Steranko page has its own dedicated paper in fact, analyzing the way different readers interpreted it! I recommend you download it and read it as well! They also created a number of other ‘ghost’ page layouts without any art, based on a number of conventions they found in a sampling of american comics. They gave the bank layouts generated from that to both comics literate, and novice comics readers [refrence link], and told them to enumerate the panels in order of how they imagined they were supposed to be read! Cool Beans. Honestly we had nothing like that to look at when i was learning about page design. We had some good examples and rules of thumb, but this is great. Now the basic six panel grid led to no surprises. It was more of a control than anything else. We tend to read that left to right, then back and again. Manga readers will reverse that. They also looked into what happens when you stagger or overlap panels. What happens when you change the size of gutters or get rid of them, and what happens when you have two panels stacked on each other next to a tall one, on either the left or the right. That last one is interesting because the same thing comes up in Drawing Words & Writing Pictures as a problematic page design. I think the example is drawn by Jessica Abel. 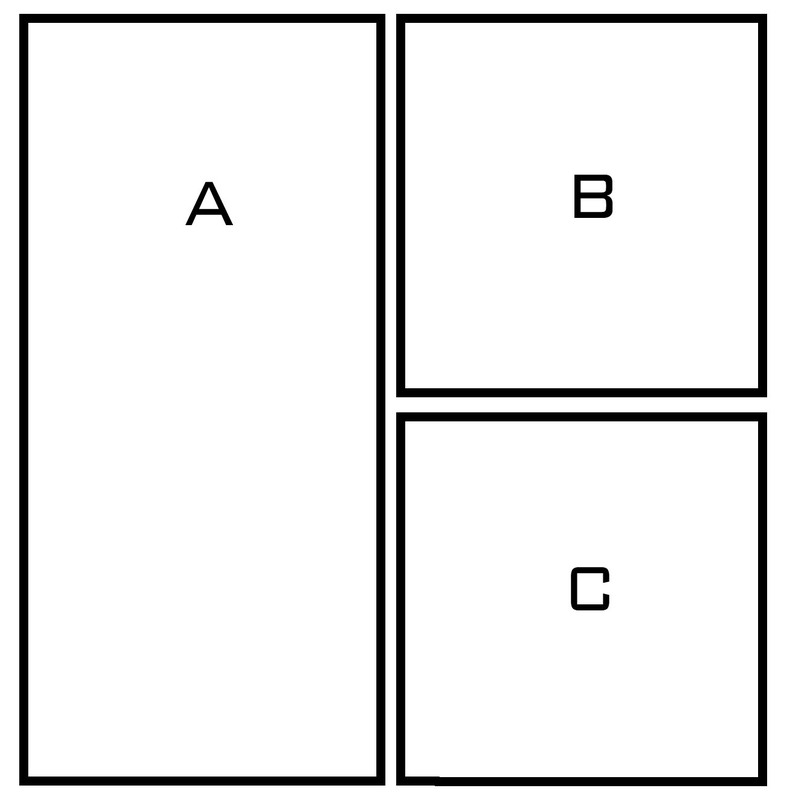 They use it to propose that when you have two panels on the left, and a single tall one on the right, there could be confusion about what order to read them in? Is it left to right, then back to the lower left? or is is left, down, THEN to the right? I think in part, the speech balloon placement in this example suggests we should read it left to right, then down to the left again. As the Eye Line created by the red arrows is much more smooth. I’ll come back to that in a moment. Z Blockage: reads across, then down. Note that a 2×2 grid, and Full Blockage, result in the same level of comprehension, the first gives you a Z reading, the second a И! In Neil Cohn’s study however, they discovered something called “Blockage”. See the two image as examples above. He’s since gone on to clarify how it works and the proportional math to when it makes readers switch [by % of respondents] from a typical Z path reading of a standard grid, to the И shape followed with full ‘blockage’. 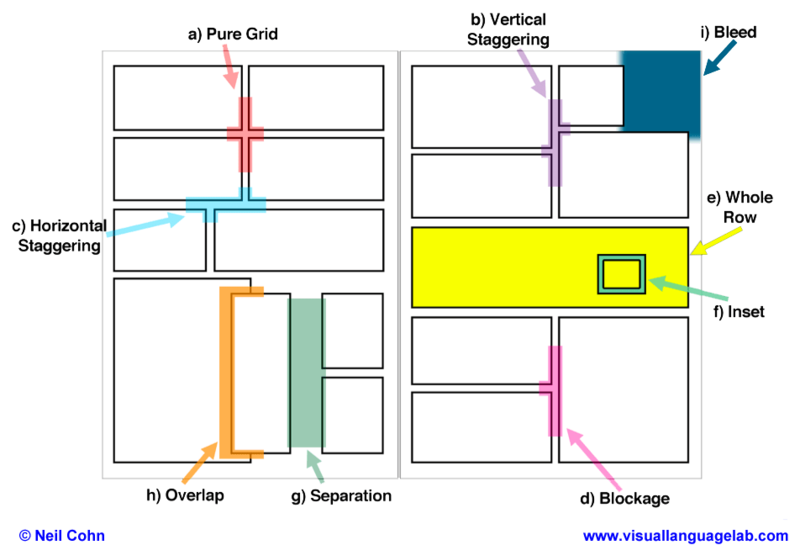 Blockage: Occurs when panels are stacked vertically next to a panel that runs the distance of the vertical panels as we see in the last example. 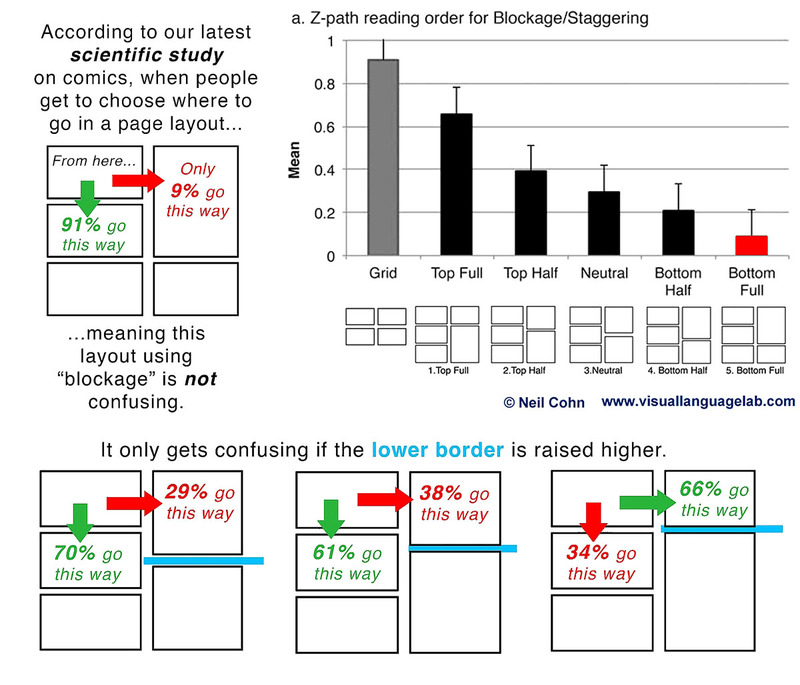 In the study they found that if the arrangement was with the two panels on the left, people read down most of the time first. But if it was on the right, people read left to right, and THEN down. That in the study is called Z Blockage. See diagrams above. So that means in the example given by Jessica Abel, the first one is typical the most likely reading? But, I don’t think you’ll read it that way. This is why I find this interesting to focus on for a moment, I read it across then down first! I think most will, dispute what the study found about Blockage. Why? Look at it here on the left without the arrows. Do you see it? I think we read this left to right, then back down to the left again…why? Because the second most important device we have in page design, is the balloon placement and sound effects! 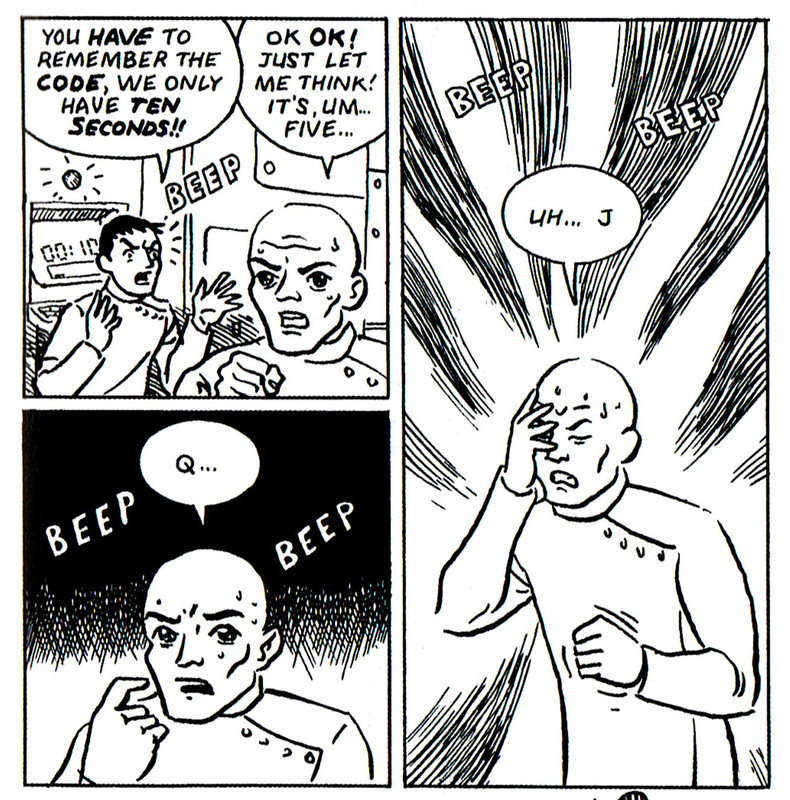 Note how in this case, the word balloon, along with the sound effects of “BEEP BEEP” in the “C” panel, are aligned with those of the same in panel “A”? They pull you to the right. Add to this the radiating undulating lines? 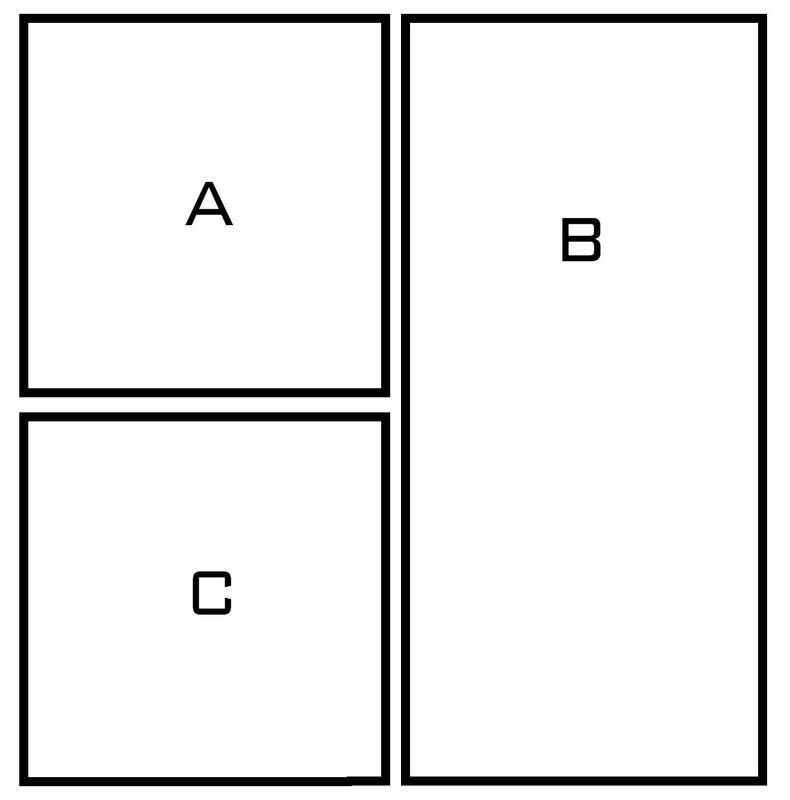 They both radiate from the figure in panel “B”, but also act like arrows for me, pointing from the edge of panel “A” into “B”. Then we look down the tail, the character is turned to the left, with that elbow pointing almost to the “C” panel. By placing the word balloons in this way, Jessica Abel has unintentionally I think, hijacked the typical reading order and gotten us to follow this one instead. It’s not explained as why it could be confusing in her book but I think that’s what happens, and until I stopped to think hard about it I also didn’t find it all that confusing. The composition of the texts read very clearly for me. I don’t think Jessica or Neil are wrong but this underlines the lack of absolutes in page layout. 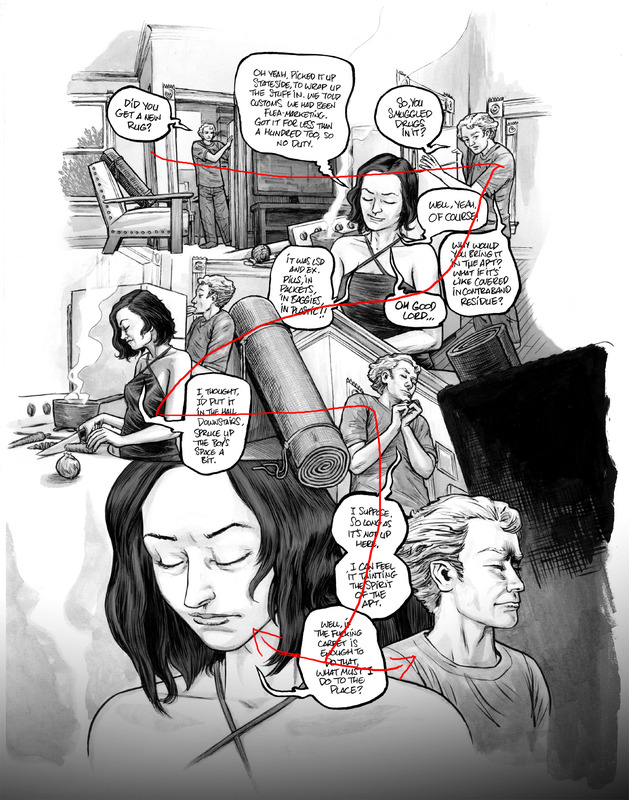 We’ll come back to word balloon placements and Eyelines shortly, but first here’s more of Neil’s findings summed up, along with a handy diagram illustrating them. Again there’s a lot more findings in the paper than i’ll share here, but this is a simple listing of key mechanical relationships. And a map of them all on one clear pair of examples. Entry-points: Orange circles in the diagram. Design elements that suggest a fixed starting point on the page design. 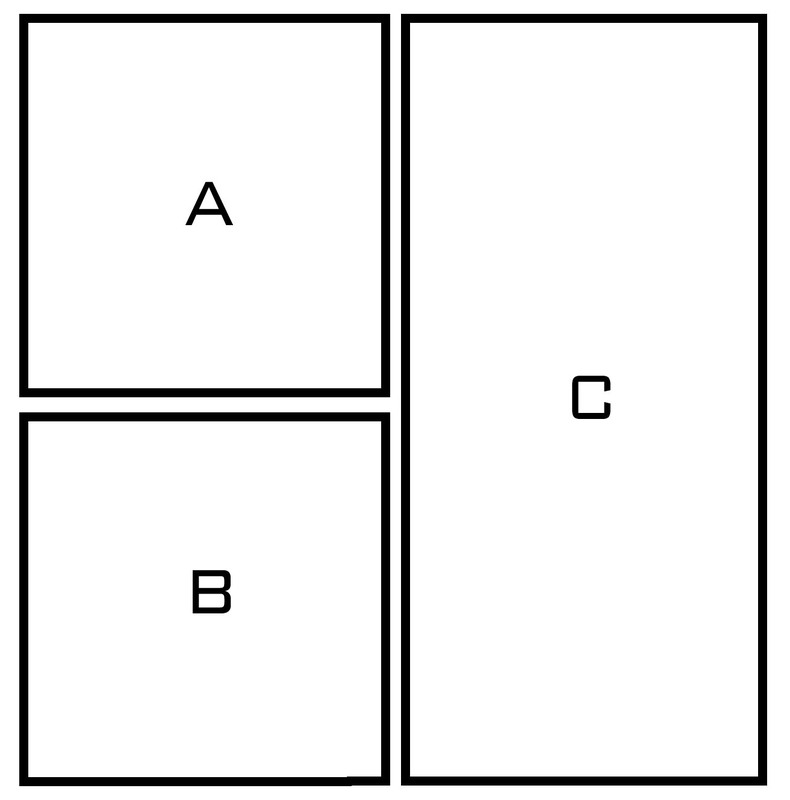 In the four shown, they are all in the top corner, rather than the default of being someplace generally in the first panel on the top left of the page. Diagonal panel borders slice up that space, leaving a few variations on where to start. If your page does not have diagonal divisions like this it’s safe to assume readers will simply start with the left top panel, probably with a Focal Point in the arts composition. Separation: The study looked at the role space between panels had in how they were clustered and read. A large gap separated panels and grouped them with panels they are closer to. Doing this could disrupt what would otherwise be a typical left to right reading, instead sponsoring a vertical reading path. Look for the purple marks in the diagram. Overlaps: Overlapping panels pretty much does the opposite of increased separation. Panels that overlap create bridges between them, strongly suggesting the panels be read together. Green markers in the diagram. Staggering: This breaks up what would be an otherwise even grid. And it can impact the reading order but typically does not in these examples. Blue markers for Staggered panels. Inset Panels: Neil’s study didn’t have a lot to say about inset panels, but they have one in the diagram, marked in Yellow. Inset panels are great for highlighting an idea. They are almost like text boxes for specific visual ideas. Anything that reversed the left to right version of a pattern, is called a “Z____” version of itself. Here’s a simplified map of the reading properties. Ok, this is all very interesting, but what to do with it? Well you can stick to a simple grid, with no variation from panel to panel in size and shape. Totally works and it does keep your job a lot simpler. Some artists swear by it, Seth has said he feels like a grid like that helps him as a reader to stop thinking about the frame and just engage in the content, and that it captures intimate personal narratives like those he writes very well. Personally I think they are best for very regular depictions of time and space, with few big jumps cutting to a different location or time frame. I then tend to expand out into a whole row or half a page to establish a new place or cut to a new point in time in the story. But even If you stick to only using a rigid grid, you still have to think about flow. 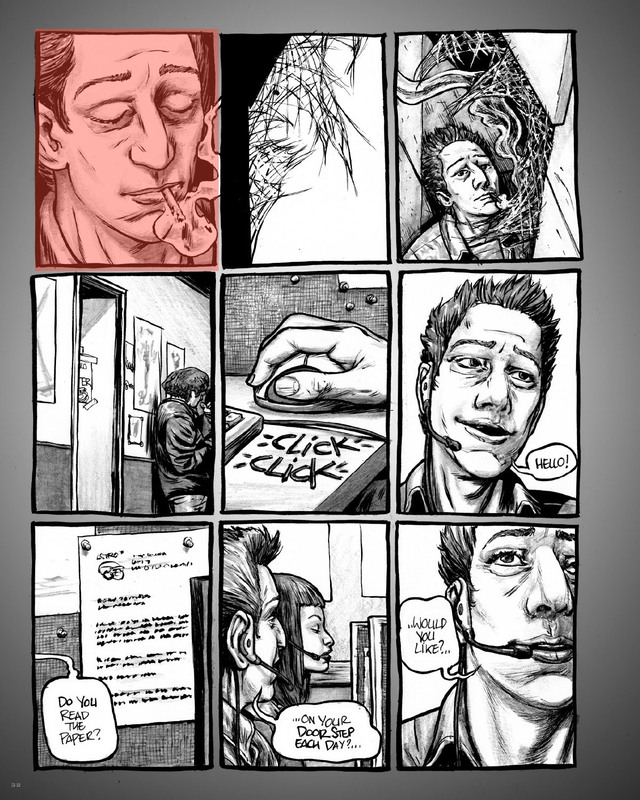 The page over all is simple, but what happens in the panels, still needs to lead the eye and read well. Here’s a great couple of simple examples pulled from DW-WP, by classic creators Bud Fisher and Roy Crane. 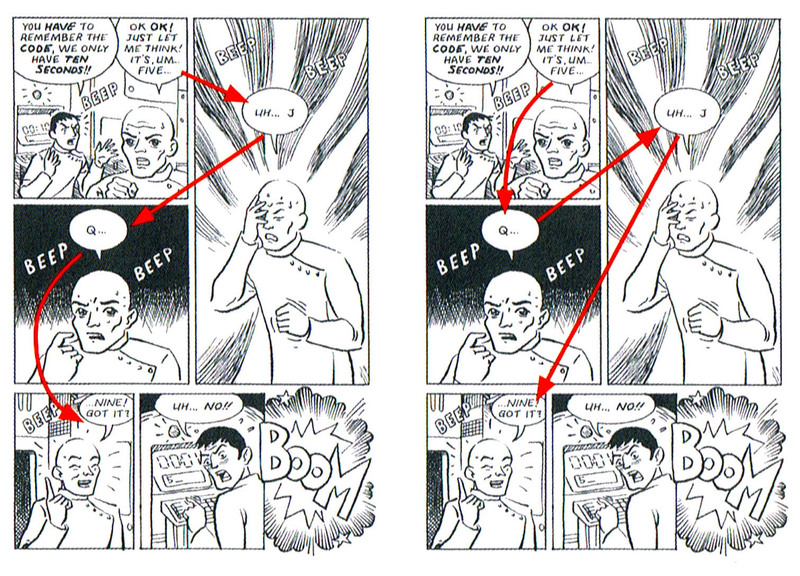 The first from Bud’s ‘Mutt and Jeff‘, shows how the action of the characters both flows with the lateral movement of the strip and helps lead the eye, complete with circling back at the end. The Second from Roy’s ‘Wash Tubbs‘, we see in the first two panels how the composition leads us into the strip, and then accentuates the action of the second half in a two panel fight sequence, by leading us our eye up, and then down. Selling the feeling of the strength of that final blow. Now this kind of designed Flow gets even more powerful as an effect when you have more than one strip of panels. Check out this great comic about making comics by Seth, ‘Down the Stairs’. Published in the Walrus originally along with an essay ‘The Quiet Art of Cartooning’. In it, only twice does he not make use of either characters eyelines [where they are looking], leading lines in the composition [edges that direct our eye to look in one direction or another] a pointing gesture, or the direction of the action, to subtly indicate the intended reading flow of the page. Note that in the first row, there’s a leading line created by the angle of the house in panel one, the bed sheets and thier heads in two, that brings up to the level of Seth’s head in three. Augmenting an implied sitting up motion. Then down stairs, over to the room and into it in a way that complements directionally the way our eye scans over those three panels in row two. Then the leading lines of the desk in the fourth panel suggest we should go back to the next row. He breaks these paterns in row three twice, in panels one and three IMO. And this I think helps bring some rhythm to the strip, helping to differentiate the first eight panels from the last eight. In panel sixteen, Seth looks out the window, in direct opposition to the stairs he talks about. His back points the way he’ll go in the next moment. In the following panel, the same-he looks in the direction we’re to read next the row, but away again from the direction he will ultimately go. The next two, his hand points to where we are to read next, and in the last, he descends the stairs one more time, and note that it’s not off the page to the right but back, into the story? Note also there are a lot of callbacks here, moments that echo each other. For example, we only see him actually descend the stairs twice. It’s suggested the rest of the time but not shown. Were it only once it would be a bit too week of a message. But more than twice, overly repetitive probably. We see him looking away from the stairs to the outdoors, twice as well. Call backs like this help with the reading rhythm and keep it interesting. They are a key part of Flow. By Jack Kirby from “The Blitzkrieg of Batroc!,” Tales of Suspense #85, January 1967 (page # 8). but STILL, sticking with a rigid Grid. 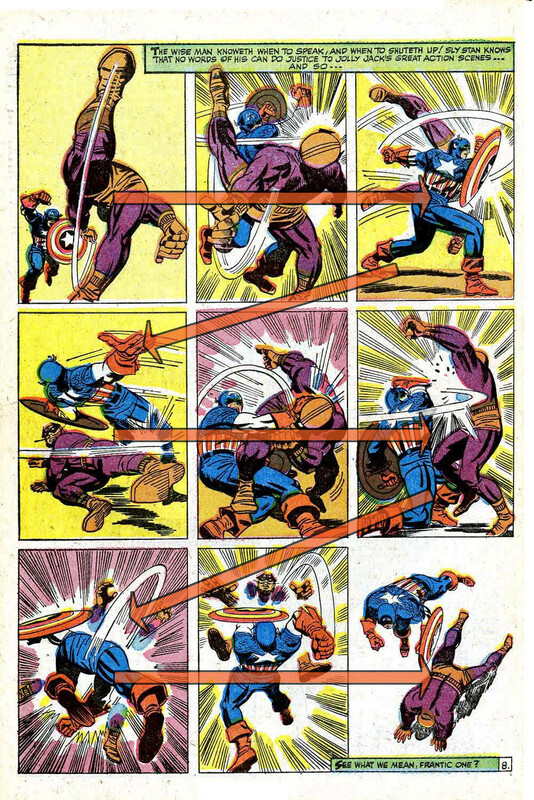 Jack Kirby used a lot of the same kinds of compositional devices to lead a reader by the eyes, and here we have a great example of him doing so in a fight scene, to sell the action! we don’t even really need to add arrows I think, the motion lines spell it out clearly! But there’s a copy of the page on the right with them in any case. Starting in the first panel, the bad guy winds up a kick, only to have Captain America punch him in the face, conveniently in the direction we need to read next! In panel three cap swings back just as we need to return to the start of the next line, and the leaning direction of his figure and the strong silhouette of his left leg, points the way down to the next row. This pattern of the action pointing the way continues really strongly throughout, until finally in the last panel, Kirby helps to punctuate the defeat of the villain, by dropping the panel borders and highlighting the figures against a white background. Caps pose has movement, as he circles around the villain who’s almost laid out prone. We won’t always want our page layouts to be quite so choreographed to read this fluidly, but it’s an excellent way to amplify the dynamism of an action sequence. 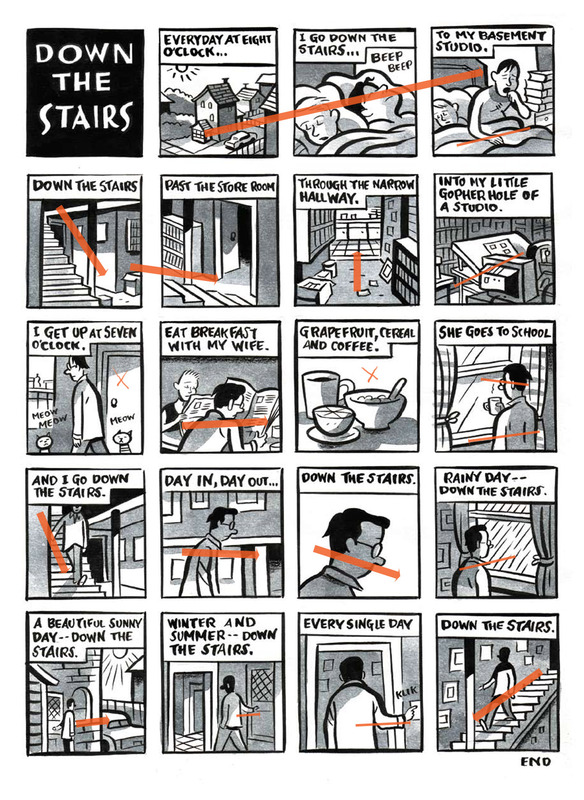 Breaking that flow as well, as Seth did in panel nine of ‘Down the Stairs’, is equally a powerful way to break up flow and create a beat in the reading rhythm. Interesting things start to happen when explore our options beyond the grids. We can start within the realm of the grid in fact, by simply looking at what happens when we join up cells in it to create varied panel sizes and shapes. Going back to the examples in Neil Cohn’s 2013 study, only example ‘D’ begins to really deviate from an underlying grid. To illustrate this here’s another fine example from DW-WP, of a page from George Herriman’s ‘Krazy Kat’. Just by placing the panels askew a bit, he’s done something visually exciting to liven up the reading of the strip in a way that reflects it’s dream like, surreal quality. Also note however, how he’s numbered the panels? Because without that cue, you would read them 1. 2. 5.! I like this example because it highlights how you can break the reading flow if you’re not careful and while numbers or arrows could be used to indicate how one should read the page, it’s not as effective as finding a way to do it that does not need to be explained. 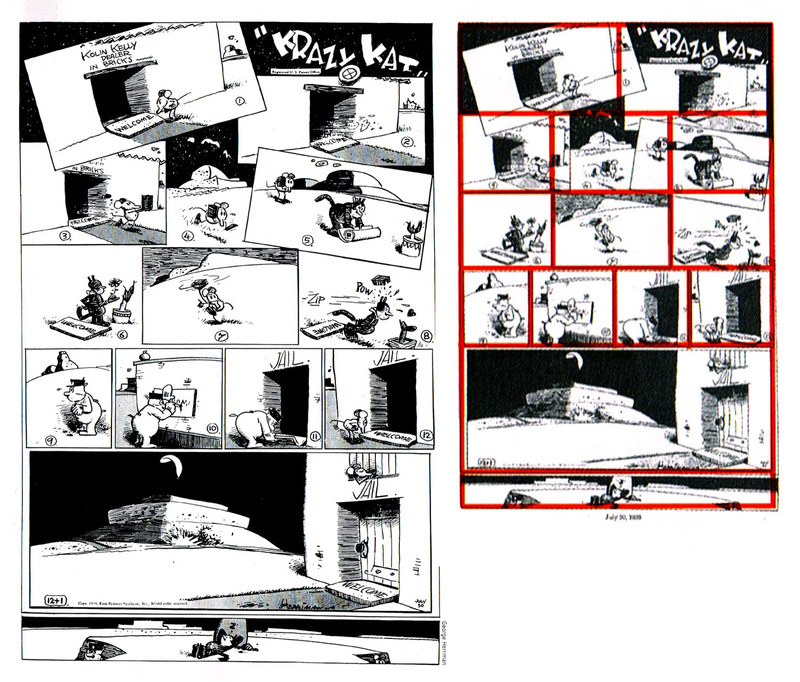 I think in this case, Herriman would have done better to have the three overlapping panels read in the visually logical sequence [1. 2. 5.] and then merged 3. & 4. into one frame, following the third panel [#5.]. He would have had one panel less to work with, but it would read more naturally. ‘Krazy Kat’ is from the early days of western comics, and numbering panels was not uncommon then as people were still learning how to read comics. Today between newspapers, web comics and comic books, most people have some basic idea of how comics pages are read, so overt indicators like panel numbering are often not required. I’m personally a fan of page designs that don’t require them. I feel it’s better that the page tells you implicitly what order to read things in, not explicitly. Here’s a modern action comic, using a very skewed layout based in a grid for a two page spread. The penciled art is by either Terry Dodson, or Mike Deodato, from Dark Avengers/Uncanny X-Men: Exodus (2009) #1. it almost works, but as the arrows on the right indicate, there’s some problems with the designs I think. Note how the extreme angles accentuate the sense of action? You can do this, but here I think the reading flow is broken up by the way the art in the panels leads the eyes and created confusing tangents. The turquoise arrows show how I think we do read it, or confusion about the order. The orange how it was meant to be read I believe. So how do we avoid this confusion? Well one way is indicated in Neil Cohn’s 2013 study! The use of space! Again spaces between panels are called gutters, how wide they are, or indeed when they disappear and panels overlap, can help us indicate to readers what order to read them. 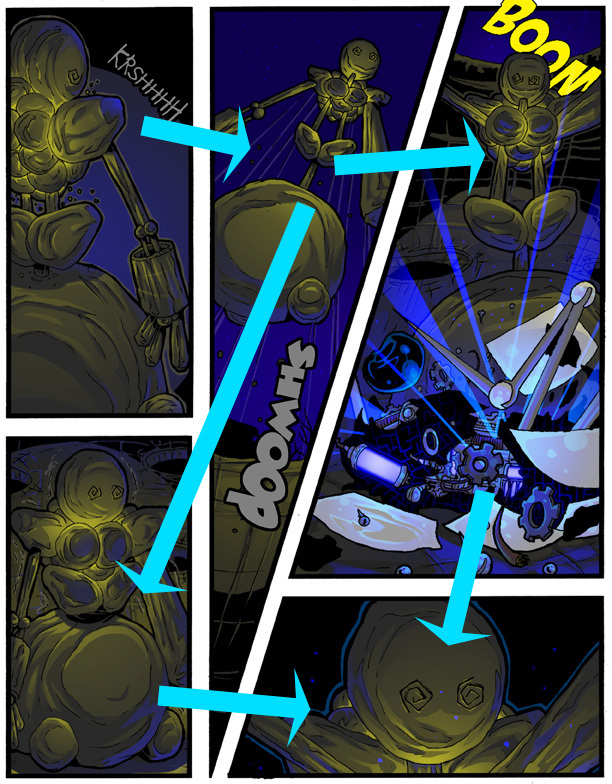 To illustrate this I found this page from Arkie Ring’s webcomic Robo Hole posted with notes about how one reader found it a bit confusing. I think it in part suffers from some of the same issues. Undesirable or distracting design tangents! Intended reading of the page. Actual, broken reading likely for some. Small changes to spacing and the SFX in panel one fix the reading. I think Arkie came very very close to the mark but missed a trick, so to illustrate how space can clarify things I’m going to edit his page to make it read smoother. First, here’s the problem the reader found: The first panel tends to lead into the third one, which derails the intended reading entirely. Note that this is again a “Blockage” situation with two panels on the left stacked next to a taller panel so in theory most will read the two stacked first. But what really misleads the readers eye here, is the sound effect, and the robot’s arms, which both point at the more dynamic third panel, rather than down to the second one first. And they do so in a perfect tangent with the robot’s arm in panel three, cementing the problem. It’s basically the same thing that we saw in the example from Jessica, but here unwanted. So by way of example, i’ve taken the liberty of shifting the first two panels to be closer to each other, and moved the third so that it’s closer to the fourth and fifth as well. 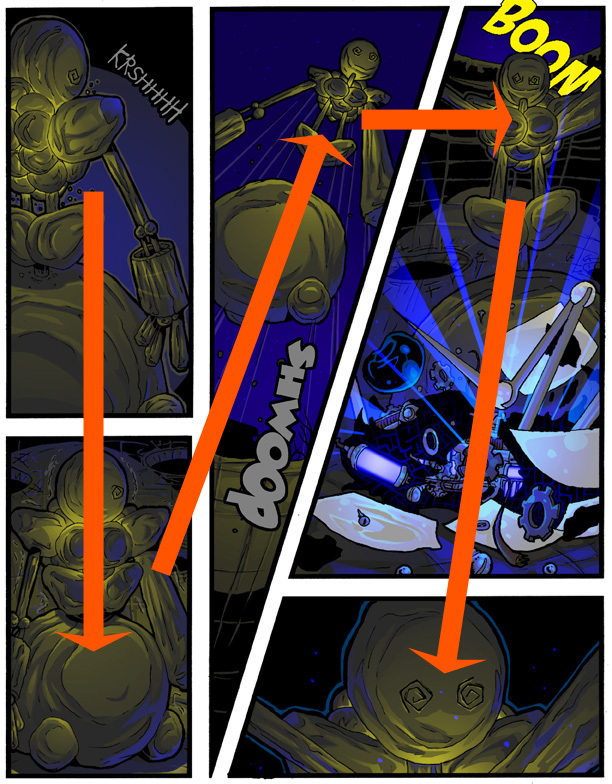 And equally important, i’ve broken the tangent, weakend it, by moving the sound effect text in panel one so that it no longer leads the reader to look to the right directly at the robot’s arm in panel three, but rather helps bring them down to the second panel below it. I think this is a great example of how small changes in the spacing in gutters, changed the beats, pacing and order of the reading of a page, especially when the layout might otherwise be confusing. Ok, so we’ve looked at how spacing, tangents in the composition, and the action in the panels can all be used to lead the reader. And in that last, how the sound effect played a role too. So how about the lettering? Leading the eye with word balloons! Now if you’re doing a silent comic, this won’t come up. 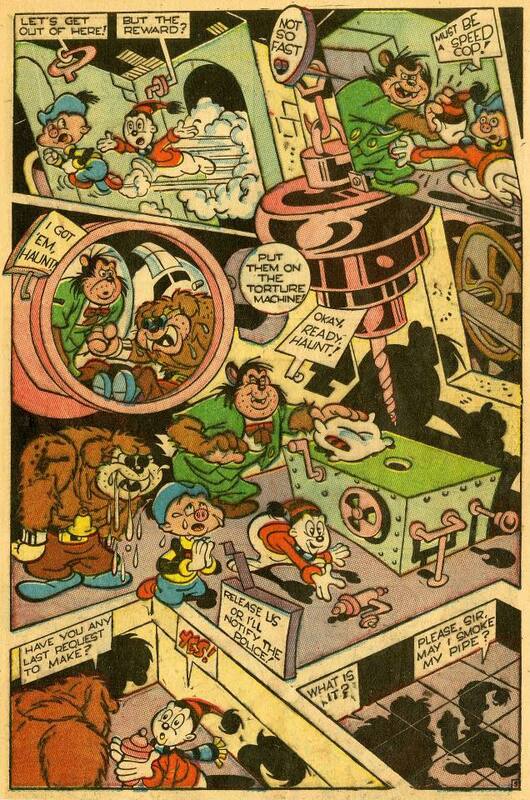 But most comics have text, and even the best layout can be undermined by badly placed word balloons! 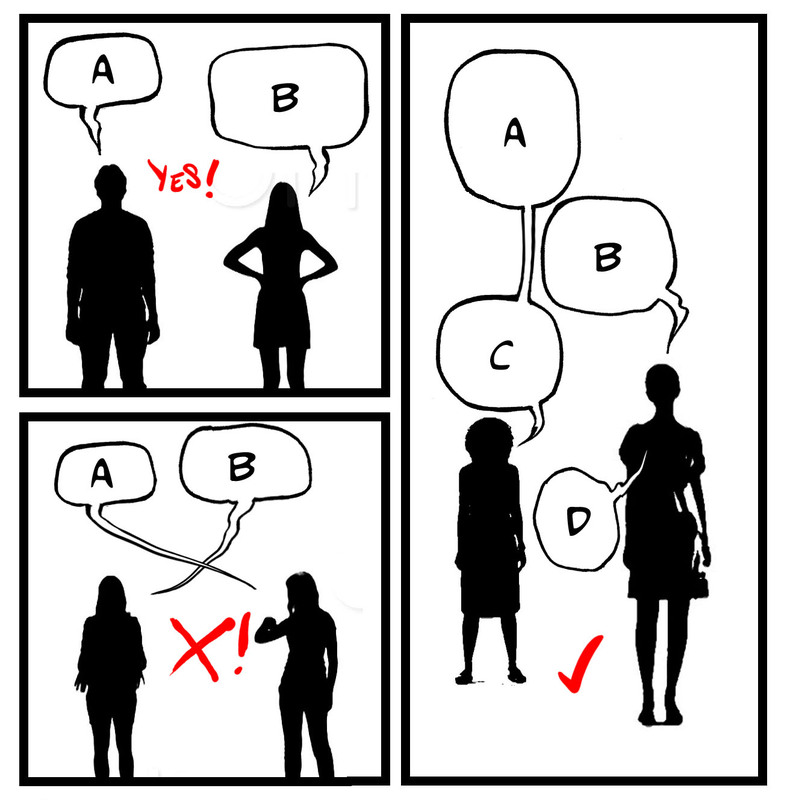 likewise, tricky layouts, can be greatly clarified by where the word balloons are placed! Todd Kline has some great notes on this, I’ve borrowed a couple of his visual aids here but you should read his full post too. On the left here we see some examples he created of “confusing balloon placements”. Note that they all force the reader to bounce from one extreme side of the panel or page, to the next. And in many cases there’s another balloon that is closer but if read next, would be in the wrong order? It’s pretty straightforward really. Note that in the first example as well in panels three and four he reverses the standard left-to-right pattern, making us double back? He also used the same panel-sets-including that confusing double back pattern in those two panels–to illustrate how to letter them as “Challenging” but readable pages! Note the lines connecting them and how they Flow? This is great, something I use a lot myself as you’ll seen in some examples in a moment. 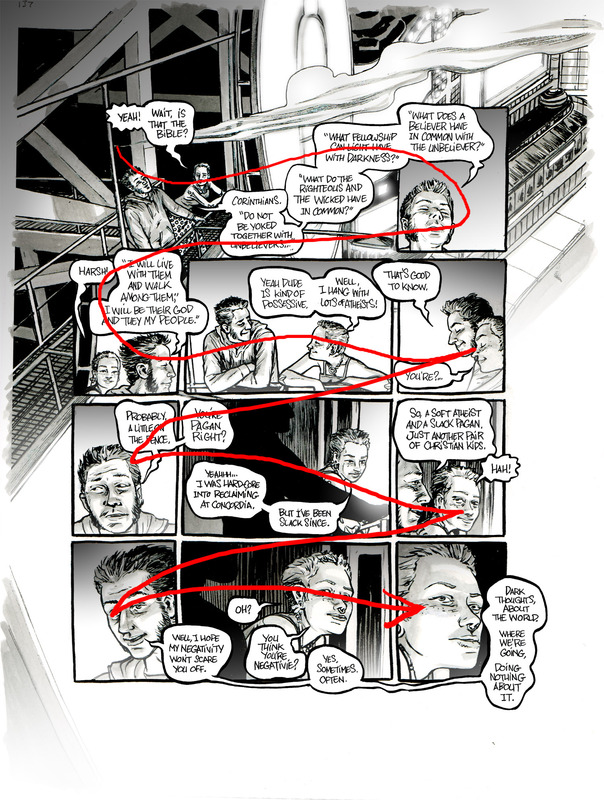 Note as well how he used the overlapping of word balloons over gutters and panel borders selectively, as cues indicating to the reader what order to read the panels in and where exactly to cross into the next panel? Perfect. He’s used the balloon placement to preemptively lead the readers eye, making bridges between, indicating which is to be read next. In more conventional page layouts, where we read from left to right and then down to the next row, the word balloons should complement that pattern. But even then they have to be placed with some concern for how the readers eye will find them. We can see a good example of what the expected looks like with this “easy” reading placement example from Todd. Note that you can almost string a line like in his “Challenging” examples? I’ll illustrate the point by drawing them in. It’s not quite perfectly fluid, but there’s not a lot of dramatic jumping back and forth, our eye can smoothly travel the page and find the word balloons along the way in logical places. Also note that in this set he never has the balloon overlap panel boarders? I do it a lot myself but this is generally thought of as undesirable. If done without care it can confuse an otherwise good page layout by making a bridge and causing the readers eye to jump to another panel in the wrong order, so be sure to be mindful of this if you ever dare. Or, just keep your balloons in the panels! 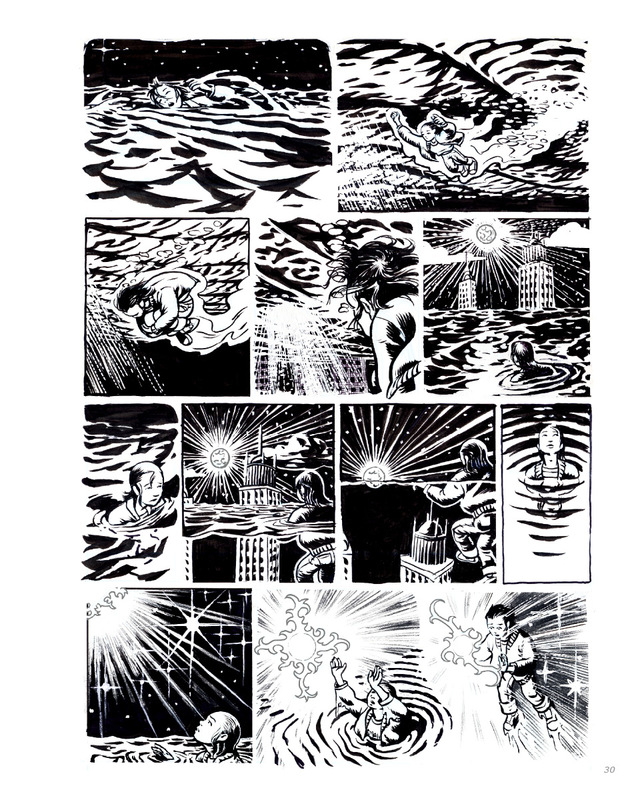 Here’s an example from my own work, Dream Life, where I used a standard sixteen panel grid, parsed into 11 panels with a mix of widths. Needing to accommodate a fair bit of dialogue I didn’t keep it inside the panels. I also chained the texts balloons, and shaped it around the art in ways hoped to complement the reading rather than make it busy or confusing. I’ve drawn in red, my hoped for Eyeline. As you can see I overlap panel boarders a lot here and in this book generally. But note how they are arranged generally to not touch other panels unless you’re ment to read them next? 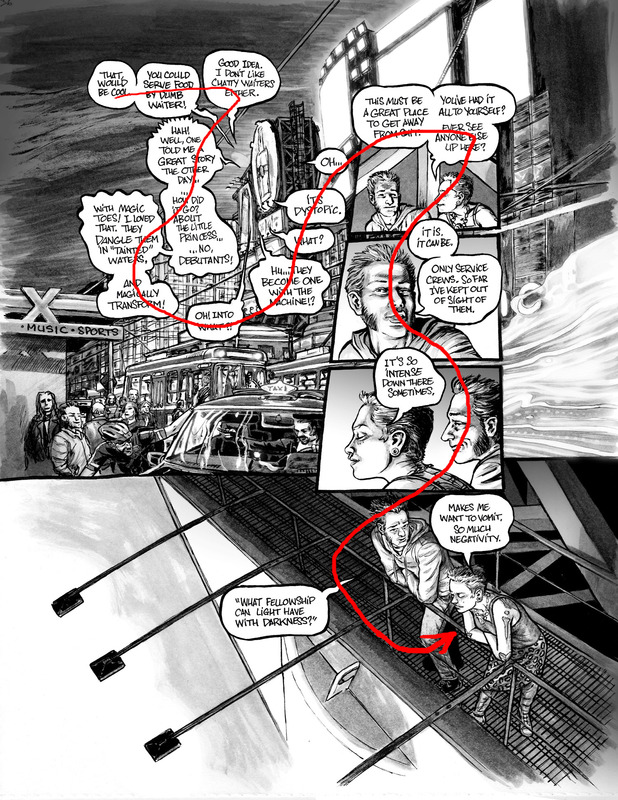 Creating a very overt Eyeline for the balloons to direct readers like this helps I think, it’s important to think about when laying out the page flow at the rough stage if you want the best results. I utilized narrow gutters and wide outer margins on full bleed pages, and broke the rule of keeping balloon ALWAYS inside panels to pursue some more elaborate uses of the text in Dream Life. There are elements of grids in both those pages, the second one it’s more secondary, but in both cases as well the eyeline created by the text is anything but linear! So near the start of this post I mention that the interval between two panels defines a moment that is cast in the head of the reader. The is called a moment of ‘closure’, and typically there is a ‘gutter’ between each panel along with the panel border themselves. Milt Stein. from Super Rabbit #7. 1946. But this isn’t the only option. Even when working with a grid, the space between panels can become simply a line, and I’ve talked here about how the size of, or absence of a gutter changes the way the moment of closure reads along with how two panels associate on the page. What is also possible when we lose gutters, and grids, is a kind of montage style of layout. Traditional gutters work as breaks between intervals of time and space. 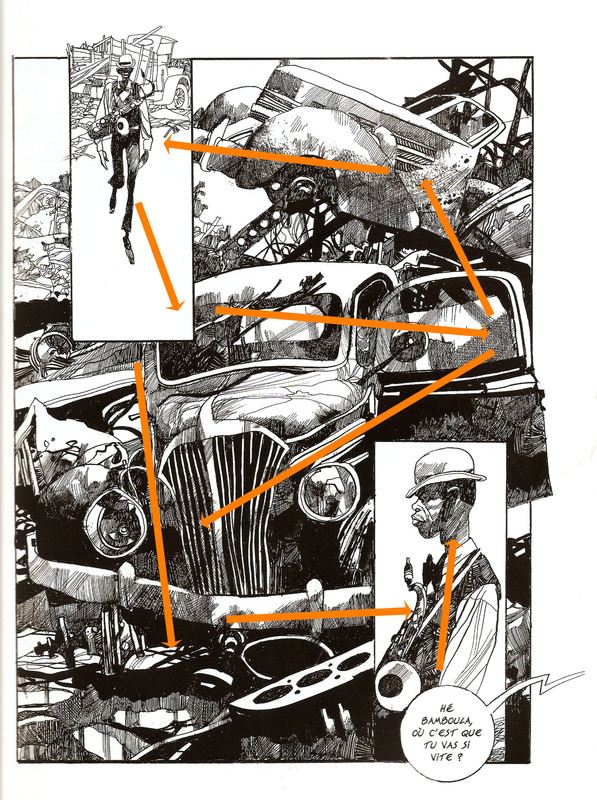 Flowing montage sequences change the dynamic a bit, with no gutters the transition between panels becomes more like movement, leading the reader through space, suggesting time. It’s a subtle difference but an effective one. I use it often in my own work, but it’s not my own invention at all. For one thing I take a lot of inspiration for my uses from the art of Diego Rivera. But posted here is a classic example of a comics page that uses both panels with gutters, sort of. And creates a larger meta space the characters move through, with levels and corners delineating the areas that otherwise would be panels. Here’s some examples of my own take on the idea. 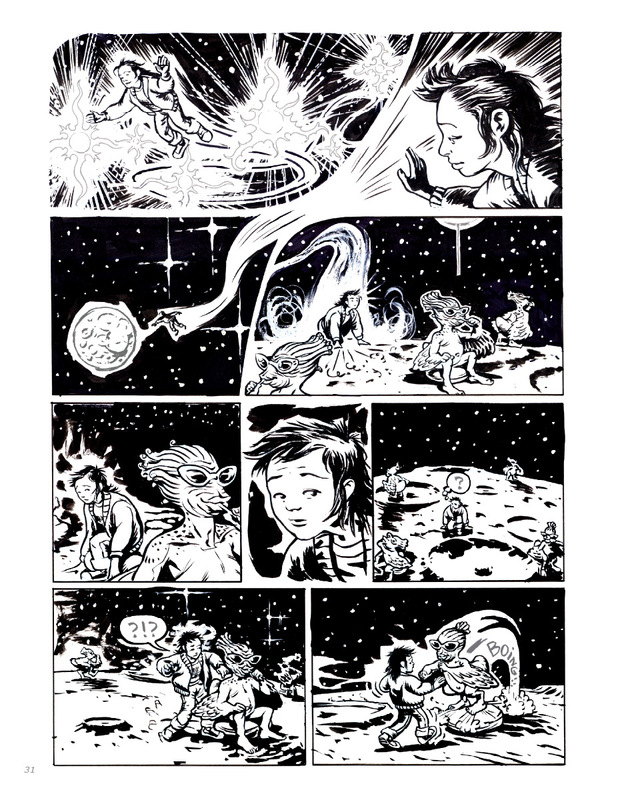 Bellow is a page from my book Dream Life, both with and without its lettering. And with my intended Eyeline, indicating the hoped for Flow of the page. it was built around the Zig Zag reading pattern, rather than a grid. It starts Left to right, but then travels snakes and ladders style, down diagonally across the anchoring object. A Rug, the couple isn’t really arguing about. It then dives down into a page wide depiction of the two characters, driving the text down between them to help indicate the state of their relationship. Directional goals of conventional eyelines created by the directions the characters are looking! From Dream Life | a late coming of ageesigned to help direct readers. The eyeline intended for the the balloons, echoing the one in the art. Now those are all fairly wordy pages, the last you can see how it might work without text but I wanted to show as well how I tried to compliment the layout in both the art, and balloon placement there. I have a whole talk posted here about playing with page design here specifically regarding this kind of non grid based, mosaic inspired Flow. 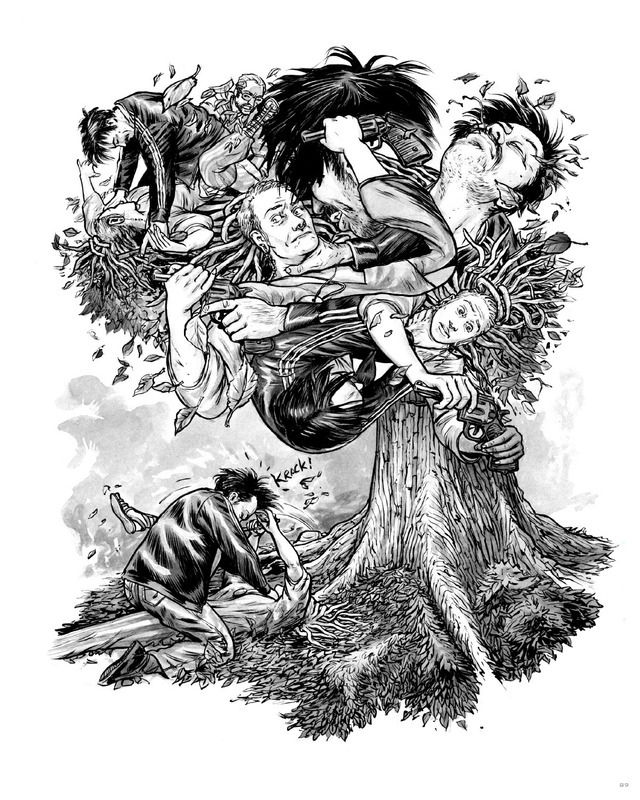 One of the pages I talk about in it is this, also from Dream Life. It was a challenge, for a number of reasons I get into in the video. Not the least is that it’s meant to both communicate the intensity and trauma of an assault, while not lingering on and inadvertantly sensationalizing it by playing it out over many panels. So I used the posing of the figures, eyelines of the characters, pointing gestures and leading lines, strong figurative contours, and textures, all to direct the eye in an exploratory trip over the page, inviting the reader to travel it for as long or little as is their inclination. There is no clear last, or even first panel, helping to obscure order and time. Instead, space is time, as your eye travels over the page. To wrap up here, lets look a couple more page designs. Here’s one from Sergio Toppi I love to show my students. Note how he used positive and negative space tiling to draw our eyes? I’ve made a copy with what I think are the compositional eyelines created by the artwork. If feels circular, feeding back on itself in a positive way the detailed textures reward. His work often utilized Chiaroscuro to highlight compositional design. Here’s a non grid based page design from my Memoir, meant to have a floating quality from old memories. Note the absence of any bounding box or balloon for the text? Instead it follows the contours of the drawing, the groupings of the text helping to give it reading rhythm the same way shaped poetry does. And indicating directional space/time in the reading as we travel from the toy, down my arm to the moment of me and my neighbor playing together. Again flow is key to a clear reading so the text is very ordered. Here’s a few silent pages I did for a comics called Misplaced. it was designed to be wordless, and hopefully a very fluid reading flow. it’s a dream told to me by a friend, and packed into a very tight 16 panel grid baseline. I attempted to employ strong Chiaroscuro style drawing that leads your eye the same way Toppi does. Overall shapes, and eyelines were the main tools I employed. Ok, that’s it for this post! Check out bellow here, links to other tutorials out there i’ve found on the same subjects and in some cases referenced here. The best way to learn is hear different ideas and try many if not all of them, so read everything you can get your hands on! Todd Klein’s great How To section on his site! Frank Santoro’s layout workbook series of posts on TCJ 1, 2, 3, 4, 5, 6. 7, 8, 9, 10, & 11.